I really liked the first, one of my favourite horror films and I am glad the sequel didn’t disappoint. Getting a sequel right it very difficult and isn’t achieved very often especially when the original is as good as ‘28 Day Later’. How did the sequel get it right then, well it started as strong as possible with a great atmosphere and amazing acting from the always brilliant Robert Carlyle. They got the streets empty, the actors are good, the virus is insanely violent and the story actually makes some kind of sense unlike most sequels. Considering the fact that there is a new director it still has a remarkably resemblance of the first film so kudos to Mr Juan Carlos Fresnadillo for his first English speaking film. Sadly however he has done a great deal since this film but at least he had this success. Six months has passed since the rage virus caused British residents to indiscriminately murder and destroy everything in their paths, and now the U.S. military has declared victory in the war against the rapidly spreading infection. As the reconstruction process gets underway and the first wave of refugees return to British shores, a family separated by the devastation is happily reunited. During the initial outbreak, Don Harris (Robert Carlyle) and his wife Alice (Catherine McCormack) sat holed up with a small band of survivors in a remote farmhouse. Their kids well out of harm’s way at a remote boarding school, Don and Alice’s outlook for the future is decidedly bright until all hell breaks loose in the country and Don just barely manages to escape the clutches of the infected. The joy of later seeing his son Andy (Mackintosh Muggleton) and daughter Tammy (Imogen Poots) as repopulation efforts get underway in London is short-lived, however, when an innocent bid to reconnect with the past sets into motion a tragic series of events. To start off let’s talk about the acting. The acting in films like this are what make them special as most of the horror films that get pumped out are full of terrible actors and it really drags down the believability of the HORROR! Nevertheless this film faithfully follows getting good actors for the sequel as it requires people who can portray loss, fear and regret. My favourite of the cast would be Robert Carlyle because he played this role of a dad who seems so good and kind but when it came down to it he was playing a coward who ran away, so not really a villain just playing a character that is very rarely in films. Anyway Robert Carlyle plays Don Harris down to the rage infected monster perfectly. I quite enjoyed Jeremy Renners character as well as the hero who defies orders and saves the innocent (haha American’s), but I always love a character who is willing to sacrifice his life for the innocent (the kind of honour you expect in snipers). The rest of the cast do well, Don’s wife is pretty good in the few scenes we see her but I would have to say Rose Bryne didn’t really sell me on her role but maybe I just have bad memory (I do have bad memory but not normally with films). So let’s talk about something more fun like the visuals. The Visual Effects in this film were really good. An improvement in the amount of action really went up from the first film, not sure how I feel about that but it was fun. However every so often it felt a bit resident evil at points which has no place in any 28 later films. The physical props were particularly good with the US military being more involved in this films plot. Just a few flaws when the helicopters blades where slicing through zombie heads but it made me laugh so I’ll let that go. The visuals on the infected were just as good as the original and just as violent as possible with blood make up. Got to love those empty street scenes, always creeps me out a little. There was one winter when I had to go to town and the streets where completely empty because the roads were closed and it was like I was the only survivor of some terrible event (really cool to be honest). I think they could have improved some of the intensity by doing more chasing scenes in side of the buildings with infected hunting people when the corridors are all blacked out with just those useless emergency lights. The best reviews I have found would be these “Relentlessly grim and grisly, 28 Weeks Later is not for the faint of heart. But its provocative post-apocalyptic theme makes for a smart and deeply unsettling film.” Claudia Puig. Deeply unsettling indeed but I manly say that the faint hearted should watch this because it is very funny (it’s not, actually very sad). 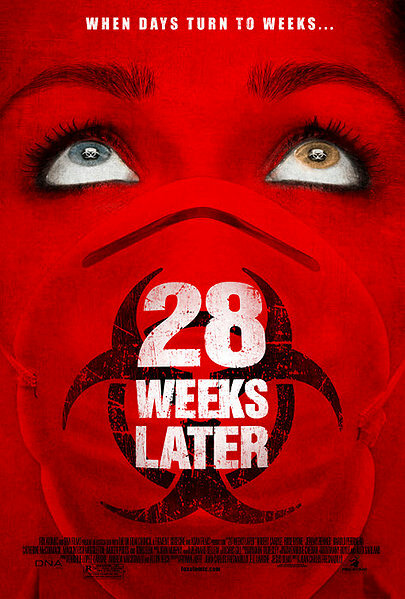 Also “28 Weeks Later contains many elements from the first film while also packing a much stronger emotional punch and ferocious intensity.” Matthew Pejkovic. I wouldn’t say that it has more emotional punch except for the first scene but it definitely runs along the same lines as the first film which is probably why it worked so well. My favourite scene would have to be the first scene when the farm house gets attacked by the infected and Don reveals his true colours as he is faced between running trying to save his wife, the scene was scary and emotionally powerful. 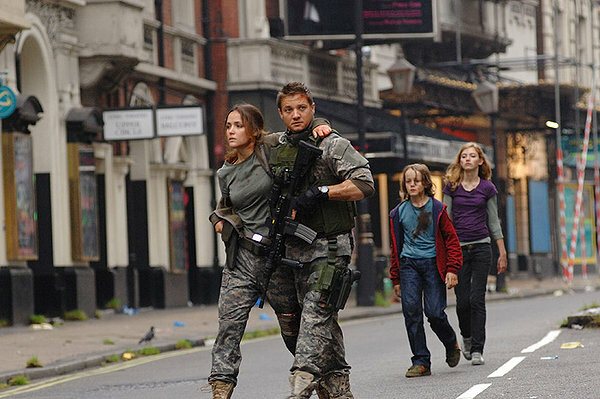 Considering there are some pretty bad zombie movies, 28 Weeks Later is easily really good for the genre. I would enjoy it more if it was called 28 Weeks Later. For me, it missed a lot of the depth the first had, especially since Boyle was great with little details. The opening scene though was amazing. That scene really made this movie great, and what did you mean you’d prefer it to be called 28 Weeks Later? I mean if it wasn’t called 28 Weeks Later. I liked that it continued where the last sort of left off with the quarantine idea, but that fact that the film itself was so dissimilar didn’t really feel like it was spawned from the first. It felt like a Friday the 13th pt 56. I like 28 Days later but for some reason I haven’t been that interested in seeing this one. I had no idea Jeremy Renner is in this, he’s not an actor I rush to see however so his involvement doesn’t exactly sell the movie for me. Just put up my review for this one and as you could probably tell, I liked it less than the original but it still has it’s moments. Good review Tim. The empty street scenes were creepy. You really did believe London was a wasteland. They must have been up at 5am to shoot those scenes. I like Rose Byrne. She’s an actress who’s often overlooked I think. Great review Tim…it seems you like it more than I do. I very much enjoy both the original and its sequel. The second does have the emotional intensity and a sense of the tragic. Fine look at this.